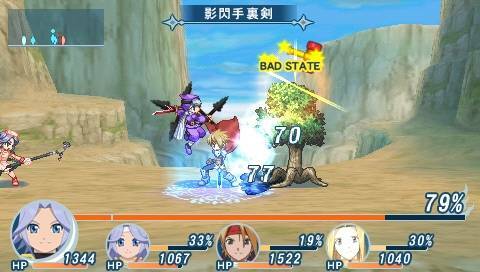 How about Phantasia SFC versus PS1? Or Narikiri Dungeon GBC versus PSP? Those are all huge remakes. I think we're losing sight of the original point. "Without additional content a remake doesn't ever match the original. I don't think there is an example to refute that." This is something I totally agree with. The use of remake here I assume is fairly liberate, meaning re-releases on other platforms later on. Sorry, I hadn't seen that yet. Although I'm inclined to include ports like this, as I would International versions (and kind of already did with Atlus ports), it is covered by having additional content. But yeah, the main reason here is probably the quick rerelease on a more popular platform, although from a different family. Isn't Tales of Symphonia's additional content pretty minimal compared to other ports? Like there're no new characters/scenarios like in other Tales ports. In that sense, Xenoblade Chronicles 3D also has additional content, with stuff like the amiibo integration and Streetpass. There are new anime movies, new sub-events, new monsters, new attacks, new costumes, and a bunch of gameplay tweaks and balance changes. The only known addition to Xenoblade is a character/monster/sound viewer mode. 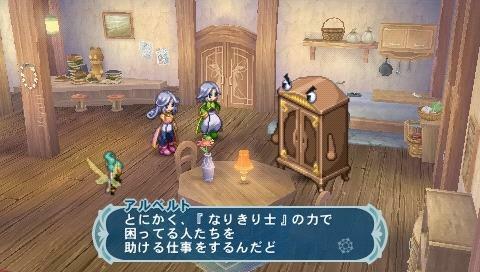 Narikiri X included a remake of the first Narikiri and, again, a new version of Phantasia which was based on the Full voice Edition previously published on PSP. There are new anime movies, new sub-events, new monsters, new attacks, new costumes, and a bunch of gameplay tweaks and balance changes. Ok well, in that case, its hard to even think of any late ports that didn't get additional content. Even without the 50000th version of ToP being included, it's not the same game. Don't know what you mean Duckroll, looks the same to me. Sonic Adventure 2 Battle outdid the original Dreamcast version with basically no new content. RE4 PS2 outdid RE4 Gamecube by a ways, though there was some additional content I suppose at the cost of a hit to the graphics. Don't get me wrong, in general I agree with the sentiment that remakes almost always do worse, and that Xenoblade 3DS will do worse. However it's not quite a universal truth. Phoenix Wright Ace Attorney Justice for All and Trials and Tribulations. Besides those 2 games, I can't even think of anything else that got a late port, yet with very minimal to no additional content, beyond digital releases. Stuff like Xenoblade Chronicles 3D is actually a pretty rare situation. Or at least, I think it is, cause I'm honestly having a hard time coming up with similar things. Even Donkey Kong Country Returns 3D got new levels, while The Legend of Zelda Ocarina of Time 3D got Boss Rush and mirror mode. Of course the game was a full remake, 5000th remake of Phantasia or not there still was two games in the same UMD and that was my point. I also got kinda lost because the word "remake" tends to be misused, like for a port with new contents, but that's something which seem to more widely accepted now, so, don't mind me as I don't want to derail the discussion more than it is already. Oh right, I thought Fisico was discounting ports/asking about remakes. Looking at Xenoblade maybe a better thing to compare to would be console games later retrofitted for handhelds? In which case most examples have the handheld conversion doing less except in cases where they really take off (Monster Hunter G/Portable, Animal Crossing GC/DS). Of course with Xenoblade we have a game that didn't do all that hot on console anyway and is being commissioned to push the franchise further, which is rather unlike most handheld ports/remakes and especially unlike every previous Nintendo handheld conversion (Mario 1-64, ALLTP/OOT/MM, Mother 1-2, DKC1-R, DKR, Fire Emblem 1/3, Starfox 64, etc). The closest would be maybe be Crystalis GBC? Crystalis GBC is a pretty different game from the NES version. I see the "How to search" stuff, but I seem to be unable to access those options on any browser. Just looks like this, with none of the drop downs. If you read the media coverage and fan opinions, online multiplayer always comes up even if people haven't seen how it will work yet exactly. Again, I'm sure it will be shown in more detail in the next presentation. Anyway, if you only give little in the way of details that doesn't mean there is no angle. I challenge you to give better examples of what XBX is about going by what we have seen. And the strong emphasis is evident in Takahashi's statement. He describes his game and gives the major aims: open world and online. Not to forget seamless (which also refers to open world). Compared to that, FFXV emphasizes the word open world but doesn't refer to online much (if at all?). So I'd say XBX is the JRPG most emphasizing its online component, by showing it in early trailers already and by the mission statement of the director. Although the online multiplayer will become a selling point once they show more of it, my main point isn't online multiplayer will sell this game (even if that might also turn out to be true). But that the online multiplayer will keep players hooked. The emphasis is there, the displaying angle is there, there is no fault in what I said. I agree and well, it's not like the online component is not emphasized since we know the title by "The use of 'X [Cross]' has implications for the online functionality". Go to the main page. You can see the drop downs there and filter to 3DS. You can't filter the console pages individually. A time when Sonic sold worth a damn in Japan. He's lucky nowadays to debut at 5k FW and then never show up again. @extralite, I wouldn't keep your hopes up. If XBX can outsell Hyrule Warriors and even hit like 150K, I'd be fairly happy. 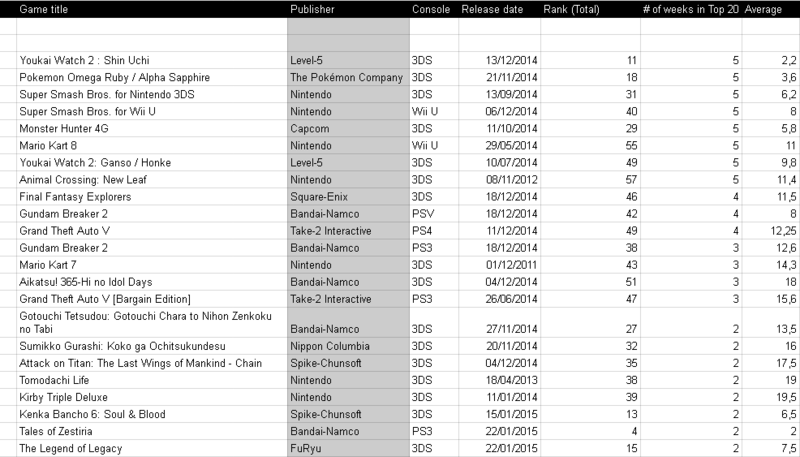 If anything, I'm hoping the DQX Wii U crowd and w/e core Wii U gamers are left who picked up Fatal Frame, Bayo 2, etc. pick up the title... We'll see though. This is Japan, the land consoles under-perform to no end. I'm not really sure how XB3D will sell, so it's possible that we have XBX sell like 150K eventually over XB3D's 100K or so. After a night of sleep I think I want to sum up my take on the sales potential of re-releases again because the points I made across different posts seem contradictory and there are some problems with the terminology used. Who do re-releases sell to? Double dippers and first time players. Why would people even double dip? Because there is new content (a point I was making), or it's a remake on a scale that provides a new experience (covered by duckroll) despite it being the same game at its core, or maybe because they are still playing that game and the re-release provides some added value, like portability (point made by Busaiku). Why would there still be first time players? Because they were too young when the game first came out (remake of a somewhat old game), or it was exclusive to a system they didn't own (Tales on non PS platforms, usually), or they didn't notice it then (re-release of a game that hasn't found success yet), or the game is better suited to the new platform than the one it was on before (MH). The general pattern that can be observed is that re-releases sell less than first releases. Basically, for a re-release to surpass the original it is necessary that the original didn't live up to its full potential. But if a game isn't successful it won't warrant a re-release. So very few examples to counter the general pattern emerge. If we look at examples that do counter it, they usually come from the mid range and the release sells about the same as before. ToS on GC sold half of what could be expected so Namco knew there were more sales to be had. So that warranted a port and the sales were to be expected. By the time FFIII was remade, the franchise had grown to 3-4 million per installment, compared to 1.4 million for the original. So the DS remake might have matched the original but compared to a newer installment (by then still 2-3 million) the ratio was similar to what we would expect from a remake. I think the remake rule is a general one. Without additional content a remake doesn't ever match the original. I don't think there is an example to refute that. even though the statement is mostly true, I was thinking of the impact of double dippers. Which is felt in all re-releases, if you can't keep enough of the fans on board there is no base to grow from. Even MH releases on PSP had massive additional content to make the fan base come back. Thanks to the multiplayer it could grow exponentially from there. At the same time I made statements to the effect that XB3D might outsell the Wii original, which would defeat the above claim. But that will be only possible because the original release might have not reached its full potential. In that regard ToS was a good example to raise because if XB3D will outperform the original it will be for similar reasons. Like I said, it will sell to new customers. I don't think people who played the original are still playing it now. For all the content it has, it is a story game. Once you beat it and 100 %ed it, there is no reason to keep playing. No multiplayer, no DLC. And you can't transfer your save either. Double dippers for a replay, in 3D, on the commute. Sure there will be some but not enough to surpass the original. I think the main point of the 3DS port is to catch new players who think XBX looks interesting but don't want to invest in a 30000 yen console. But since they already own a N3DS, or were thinking of buying one they might go for the old game instead. People who liked the original will most certainly prefer the new game though, especially since the port lacks new content. Which is kind of rare because normally you don't want to pass up double dippers. But it makes sense if we assume that XB3D is aimed at reluctant potential new players. Nintendo doesn't want double dippers to negatively impact sales of the new game. January 2015 edition of my leg-o-meter. Nothing really interesting, as it's just the first month of the year. Goddammit, it's been sold out for several days now. Bye bye weekend sales. I think predictions of 1M or more for Persona 5 in Japan are more based on wishful thinking than anything else. 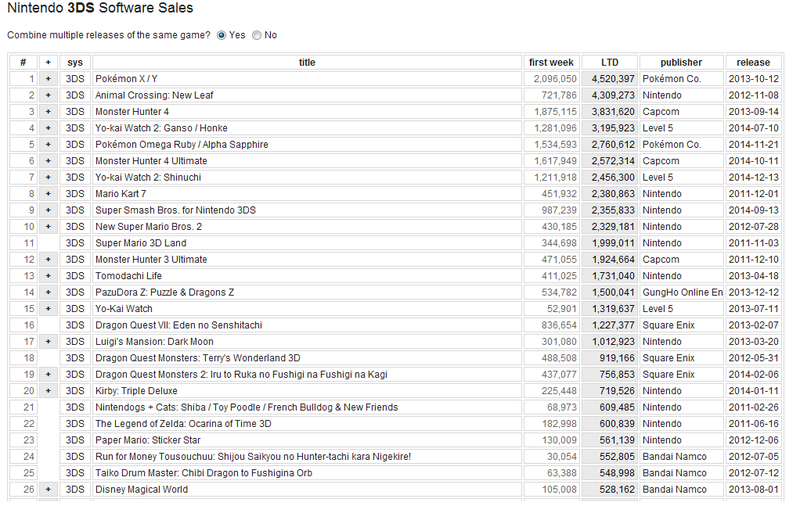 It is true that persona is more popular now, but 1M is more than 3 times what Persona 4 sold. I expect that the growth is more at consolidating the fanbase, which means that Persona 5 should do 300k - 400k as fw instead of LTD, but I also expect it to be more frontloaded than the other Personas, more like Tales games. If Persona 5 does Tales of Xillia numbers, it will be quite a success. If these predictions come true Samurai Warriors 4-II could come close to Samurai Warriors 4 opening for an expansion it is. On the other hand it was a low opening for Samurai Warriors 4 to compete. I'm surprised it's seen this much success. I thought that F2P on a platform bought mainly by people who want "full" games would not go down so well. Tales of Zestiria's sell back value has dropped through the floor on amazon. You only get 361 yen at max if you sell your copy to them. that's not unusual with popular games on amazon, right? i think i remember mh4 dropping to 500y very very early too. I'm not too sure myself, but it's going around Japanese forums and blogs which they were all making a big deal about. Didn't Monster Hunter get the drop when they announced its G version? Far Cry seems to be holding on pretty well. This game seems going well in preorders (over 60pts on Comgnet). It might a further proof that anime tie-in of minor IPs are actually viable on 3DS. Damn, Wii U's collapsing in Japan. Once more Japanese 3rd party titles starts coming in on PS4, it's over. The Wii U is only about a million owners above PS4 as of now in that region. Once more Japanese 3rd party titles starts coming in on PS4, it's over. The Wii U is only about a million owners behind PS4 as of now in that region. It's going to be interesting to see how it performs, because as Hiska reminded me recently, COMG tends to inflate anime-tie-ins quite a lot (Magi on 3DS; Irregular Magic High School on Vita). It's certainly been doing extremely well in pre-orders there lately, though. Well, even with a debut close to 30k, it'd be successful given how low-budget-y the game looks. 3DS, though, has a good record in selling this kind of tie-ins. A game, on the other hand, that doesn't seem much anticipated is the new Senran Kagura. It'd be hilarious if it ends up selling close to SK2 on 3DS. yea... wii u may not be doing well but the ps4 is doing crappy too, the third parties wont help it. im assuming the both do similar numbers in the end. When is Estival Verus out? I imagine it will do better than SK2 but I'm not sure it can match Shinovi Versus without the anime. PS4 will do better in the long run but it's going to take a while. Senran Kagura: Estival Versus will be out on March 26, along with Bloodborne, Disgaea 5, One Piece: Pirate Warriors 3, Sword Art Online: Lost Song, Deception IV: Another Princess and many others. AKA RIP Wallet Day. There's a Senran Kagura: Estival Versus OVA that'll be aired on TV but I don't know if it'll help boost sales. Oh shizz yeah, there is going to be quite a few bombs that day. I didn't know about the OVA. That might help. March 26th will be a day of bombas. I expect all but one or two games underperforming. I fear for Nippon Ichi come March 26. It could get ugly. Oh it's airing on TV as well? It was always advertised as a collector edition bluray bonus before that. Yeah, it says in the link that the OVA will be aired on AT-X on March 29, 9.00pm ~ 9.30pm. BTW PS4 Nyuu Nyuu DX Pack comes with a product code for downloading the OVA, not Blu-ray disc. Dengeki PS occasionally covers non-PS games if they think their readers would be interested in them. IIRC, they covered some Persona Q stuff. Yup, I believe they also had some key info back on Theatrhythm back when it was announced.